BOSTON - Friday, September 22, 2017 - Mayor Martin J. Walsh today joined Bridge Over Troubled Waters, local elected officials and the Brighton community for a ribbon cutting celebration for Bridge Over Troubled Waters' Transitional Residence, a $4.5 million renovation and expansion project with 28 units of supportive housing in Brighton. The buildings' new and expanded features enable staff to provide life-changing opportunities for youth and homeless mothers with families to help them prepare for fully integrated independent living. 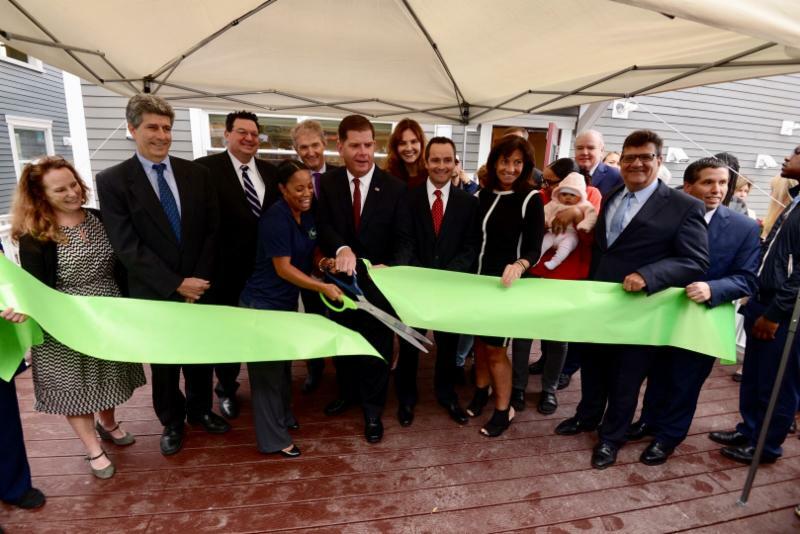 "Bridge Over Troubled Waters housing program is an example of the public and private sectors working together so that our most vulnerable populations have a safe home ," said Mayor Walsh. "The redevelopment of these buildings marks another major milestone in creating permanent and supportive housing for homeless youth. I want to thank Bridge Over Troubled Waters for their long-standing commitment and dedication to supporting Boston's young people who need a helping hand." This new supportive housing program, which welcomes youth as well as mothers with families from all backgrounds, can serve up to 50 youth and children at any given time, providing them with the tools, developmental experience, and learning opportunities they need to thrive and succeed. "This residence is not a shelter -- it is a home that supports our youth, giving them the stable environment they need to help them achieve success and become independent," said Elisabeth Jackson, Bridge Over Troubled Waters Executive Director. "Bridge has been working with at-risk youth for more than 47 years and we have helped thousands who would have otherwise had nowhere to turn. We are grateful for the tremendous support from Mayor Walsh and the City of Boston, the state and federal governments and from private donors who have all come together to transform our dream into a reality." Each year, Bridge over Troubled Waters supports hundreds of youth and moms with children with emergency and transitional housing, on-site medical and dental services, counseling and support services, educational and career development, job training, help with employment placement and affordable permanent housing searches. Their dedicated and skilled staff offer a holistic continuum of care approach, including social workers, case managers, trained educators and volunteer medical staff. Working with the youth as a team, they help identify and bridge serious gaps in skills, address emotional and social challenges, and overcome barriers to employment and increased financial independence. "Bridge Over Troubled Waters is dedicated to providing vital services to the homeless and at risk youth of the community to help them transform their lives for the better," said Bridge Over Troubled Waters Board President Dan Buoniconti. "We are so very grateful to the government and private organizations who have given so generously to our cause, and we are immensely excited about the opportunity to serve more kids in need that this expanded housing program will provide." The redevelopment of the former transitional residence was made possible in part through private support of more than $1 million from the Boston Neighborhood Housing Trust Fund. Residents also have received project based Massachusetts Rental Vouchers from the Commonwealth's Department of Housing and Community Development. Additional funding support was provided by Liberty Mutual Insurance,Yawkey Foundations, as well as many other community donors. Transitional Living Program (TLP) is Bridge's long-term transitional living program with 14 single bedrooms for males and females, one handicap accessible bedroom with two beds, and two bedrooms with four beds reserved for runaway youth. Residents have access to all of the services at Bridge; and may stay in the TLP for up to two years. Single Parent House (SPH) is Bridge's transitional living program for up to 11 pregnant and/or parenting homeless young women with up to two children, who may stay for up to two years. All residential programs, except for the Warming Center, are open 24/7. Last year, 100 youth and eight families were served in these transitional living programs. Runaway Program Bridge is the local respondent for the national runaway hotline offering 24-hour access to a counselor and safe overnight accommodations away from the streets for homeless youth, ages 14-17, for up to 72 hours, in accordance with federal law. Bridge served 61 youth last year. Below is an excerpt from Bruce, currently a full-time student at Boston University, and resident at the TLP. He has been with Bridge since he was 17 years old. "Bridge helps us stay safe and gives us a stable home. We have once a week community dinners where everyone in the house attends and hangs out. They supported me whenever I needed help. The counseling staff really helps all of the people in the home figure out our next steps whether it's a job or school. I've been fortunate because I've been able to use the College and Career Program, the TLP, medical clinic, counseling and the Basic Center Program. Now I attend Boston University. Bridge is here to help anybody who needs and wants help. I now have big plans for my future thanks to everyone who has supported me; without Bridge I might still be struggling." Last year, Mayor Walsh announced an additional $1.3 million investment for homelessness services in Boston and to further the goals of the City's Action Plan to End Veteran and Chronic Homelessness in Boston. The $1.3 million allocation supports the implementation of the Mayor's Homelessness Action Plan which covers three main areas: Supporting front door triage; rapid re housing rental assistance; and increasing assistance to Family Aid. The Mayor's FY17 budget also included an increase of $2 million in federal funds to provide low barrier permanent supportive housing for the homeless. Taken together, these allocations and the support of homeless provider partners are furthering the goals of the Mayor's Action Plan and providing a safety net for some of Boston's most vulnerable residents. Today's announcement ties into Imagine Boston 2030, Boston's citywide plan, which has a stated goal of proactively encouraging a broad range of housing growth for people of all income levels and stages of life. For more information on Imagine Boston 2030, please visit imagine.boston.gov.